Hello and Welcome. I’m Loretta, the creator of Stitching the Night Away. The website began as an extension of my passion for cross stitch. 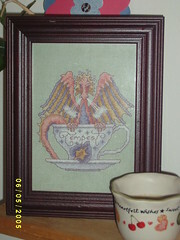 I’ve been a cross stitcher since I was 8 years old. It was something I learned as a Girl Scout, we did a project for a badge related to crafts and the group choose to cross stitch a holiday design on a red sweatshirt using waste canvas. I was one of the first ones finished and I’ve had a needle in my hand ever since then. The biggest goal of the website is just to share the joy of cross stitching with others. Many people still seem to buy into the stereo type that it’s “an old lady past time” and this simply is not true. From visiting message boards and cross stitch shops I know that there are just as many young people that are interested in cross stitch, if not MORE. And those stitchers are stitching some of the most beautiful and unique cross stitch projects you have ever seen. And we’re inspiring whole new generations of cross stitchers, quilters, and needle workers every day! The average stitcher is definitely not what the stereotypes would make you think. We’re just average every day people just like you. One thing I have found with frequenting cross stitch communities is that it’s where you will find some of the nicest, most passionate, creative, and interesting people on the internet. Thank you for visiting us here at Stitching the Night Away, I hope you enjoy your visit and I love hearing from our readers!